This is a pretty simple DIY, but it can make some cute gifts for your geeky special someone. I ended up creating two of my own designs for this project, which made me very excited. The ones that I created were for two of Amaterasu’s weapons from Okami, a game that came out for the PS2 and later the Wii. 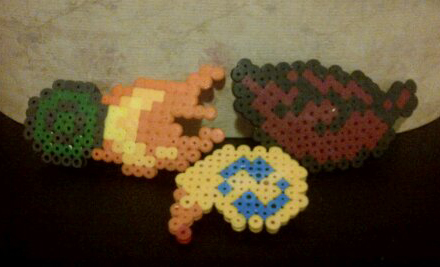 The others, Mario’s Super Leaf and the Animal Crossing Leaf, I found versions of on pinterest. I tweaked their designs to fit my style better. 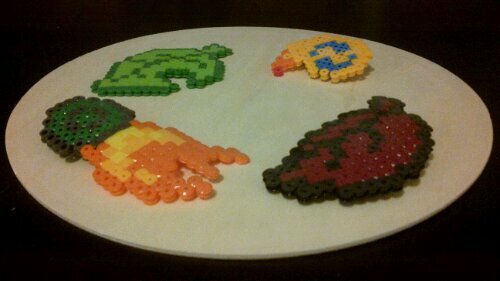 I like perler bead designs that are simple, and do not use too many different colors for the design. Time: For one barette it will take about 20 minutes, more or less. I ended up making three barettes, with a few trail and errors. It took about an hour or two for myself. Step 1: Make a Perler Bead Design. Get a perler bead pegboard and put the perler beads on the pegboard in the design you want. Cover it with wax paper. Turn on the iron to about medium heat and when the iron is ready, place it on the wax paper. Be careful, you don’t want to burn yourself in this step. It usually takes about two minutes before the perler beads are melted and ready for you to remove the iron. I like to take my pieces off the pegboard and iron the other side of the perler beads with excess wax paper at this part. This will “seal” the perler beads in place by melting both sides. The perler beads will look flat, but they will be more durable. Now let them cool down a bit before you remove the wax paper. In this step, all you have to do is place superglue between the alligator clip of the perler bead piece. Be careful not to superglue your fingers to the perler beads. That’s it! You’ve created a cute, geeky barrette! Not all perler bead designs are good for barrettes. You want a small design. I ended up not using the Animal Crossing leaf because it was too squared. Designs that are long and narrow work best for barrettes for the back of your hair, and small round ones are great for pulling back bangs.